Apricot tress have lovely foliage and make a distinctive addition to any yard or garden. They make a great shade tree in the summer, and in the fall, their leaves often turn bright colors before falling to the ground. 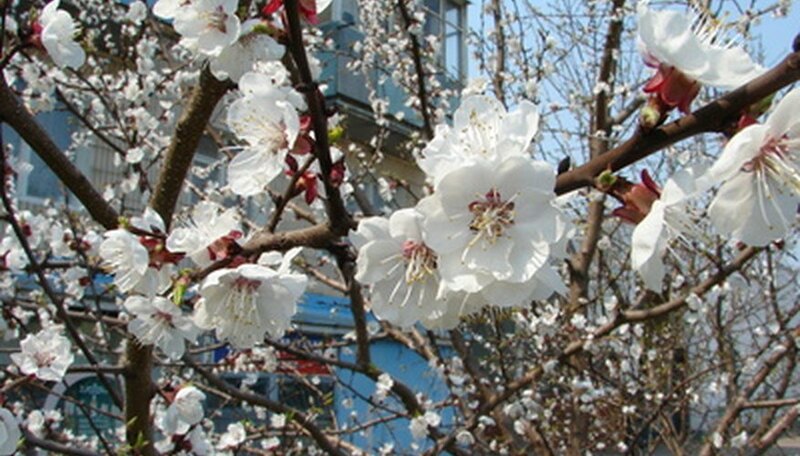 In addition, the fruit of the apricot tree is sweet and juicy. It can be eaten raw (straight from the tree), dried or preserved, or it can be made into pies. Apricot trees are self-pollinating, which means you only need one tree to have a great harvest. Apricot trees bloom in very early spring, usually the first tree to put on bright, white blossoms. While the apricot tree requires minimal care, it is necessary to water it correctly to maintain a healthy tree for many years. Use your shovel to build an earthen dam around the apricot tree. The dam should be approximately 5 inches high and extend as far out as the canopy of the tree. Be careful when looking for soil with which to build your dam that you do not damage the shallow roots of the tree. Fill the entire basin you've created with approximately 4 inches of water. Allow the water to drain. The water should soak into the soil within one hour. The first deep watering of your tree should take place in early spring, just after the soil has begun to warm but before the tree begins its growth cycle. Apricot trees need deep watering early in the year because they put on most of their blooms in early spring. Fill the basin of the tree with 4 inches of water once each week unless the weather is extremely hot or the tree shows signs of water stress, such as wilting or dying leaves during the summer growing season. Unless conditions are extreme, the tree should not be deep-watered more than four times each month. Too much water is just as bad for apricot trees as too little water. If the water does not soak into the soil within one hour, reduce the frequency of your waterings to every 10 to 14 days.